For years, hair loss has been a reason for concern for both men and women. There are many theories surrounding the reasons for hair loss, how to avoid it, and how to reverse it. But what is true and false? It’s time to clarify some common misconceptions about hair loss. Washing and combing your hair frequently is not good. It’s a myth. Some people avoid washing their hair too often because they fear that regular use of shampoo can damage their scalp. Experts recommend that hair should be washed regularly because too much oil will block the hair follicles. It is also advisable to comb your hair often and gently. The habit increases blood flow, which helps hair growth. Second belief is that diet affects the growth of the mane. It’s a fact. A poor diet triggers hair loss. Vitamin deficiency, for instance, is harmful to hair health. Researchers say that a nutrient-poor diet can worsen and accelerate the condition. Embracing a healthy lifestyle helps hair growth which is why exercise and a healthy diet are essential. Lastly, chemical-based treatment is a quick and effective solution for hair loss. This is a fallacy. Chemical treatments may result in some hair re-growth, but they include the risk of harmful side-effects which includes skin irritation, scalp itchiness, inflammation, and swelling. 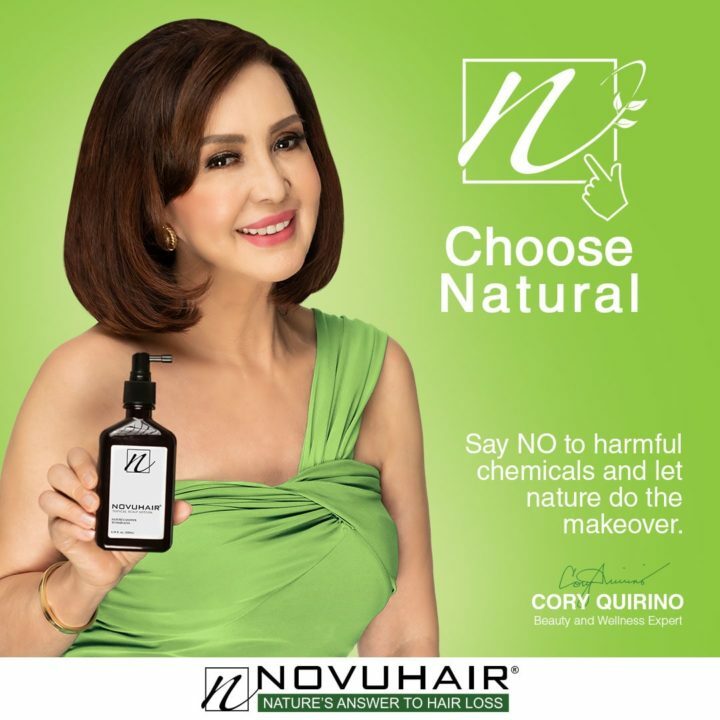 Beauty and wellness icon Ms. Cory Quirino said that the best solution for hair loss is to go natural. Besides keeping a healthy lifestyle, she stressed that using natural ingredients will help improve the condition of the hair and scalp. Natural ingredients such as aloe vera, ginseng, virgin coconut oil have been proven to treat hair loss. Luckily, you don’t have to look for each one because there’s a product that has all these natural ingredients—NOVUHAIR. This is the only natural scalp lotion in the market that helps promote growth of the tress—thanks to its unique combination of 19 natural herbs, essential oils, and co-factor nutrients, all working synergistically to remedy hair problems from growth to vanishing. It penetrates deeply to help rejuvenate, nourish, and maintain moisture in the scalp and hair. Now that you know the myths from the facts, it’s now time to maintain a healthy hair and scalp. Go for the effective and safe solution that is NOVUHAIR.